The family Solanaceae, made up of more than 2,400 species, is especially noteworthy. Many of its members contain the alkaloids atropine (dl-hyoscamine) and scopolamine (hyoscine). Atropine shows up in mandrake root, henbane and thorn apple; it constitutes just over 4.5 percent of the asthmatic preparation called Asthmador. 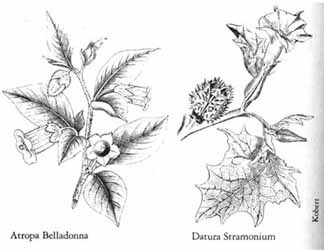 Schultes and Hofmann claim that there are no reports on the effects of atropine alone "which could explain the addition of belladonna as an ingredient of magic brews in medieval Europe." But Hoffer and Osmond recall several historical incidents that attest to its psychoactivity. 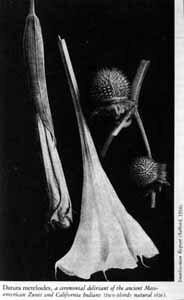 One story involved a family of five who in 1963 ate tomato plants that had been grafted onto jimson weed, producing 6.36 mg of atropine per tomato: "All five developed deliroid reactions of varying intensity and some had to be treated in the hospital several days. This seems to be the first known instance of hallucinogenic tomatoes." The names atropine and belladonna both relate to this drug complex's effects. The former is derived from Atropos -- one of the three fates in Greek mythology -- as a result of its being used as a poison during the Middle Ages. The latter refers to its ability to dilate the eyes of "beautiful ladies." Both are used nowadays in medicine as an antispasmodic, especially for parkinsonism, with an average dose of atropine being 0.5 mg. users have survived dosages of more than a gram, but the effects appear toxic in most cases of 10 mg. or more. Probably the more important chemical in most belladonna alkaloids isscopolamine. 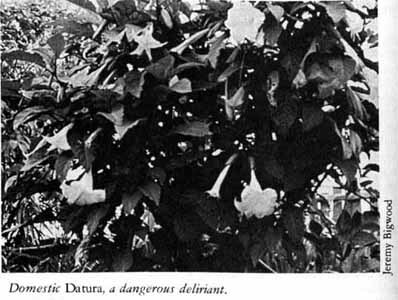 It appears not only in the already-mentioned sources but also in several tree barks used by natives that are known as Datura. Appreciated early on in both hemispheres, it has been used in the Near East to compound the effects of cannabinols and in the Andes to add to mescaline-like effects from the cactus Trichocereus pachanoi. In asthmador, scopolamine constitutes 50.4 percent of the mixture. Tim Leary has been quoted as saying he never heard of a good belladonna trip; my own experience has been an exception.